The ancient circle squaring problem is impossible to solve using strict compass and ruler construction proticals. About 100 years ago the mathematical prodigy Ramanujam came up with what was then the definative solution to this problem. Employing strict compass and ruler construction proticols he was able to come up with a solution to this problem that pushed the level of fidelity of it to 8 decimal places. 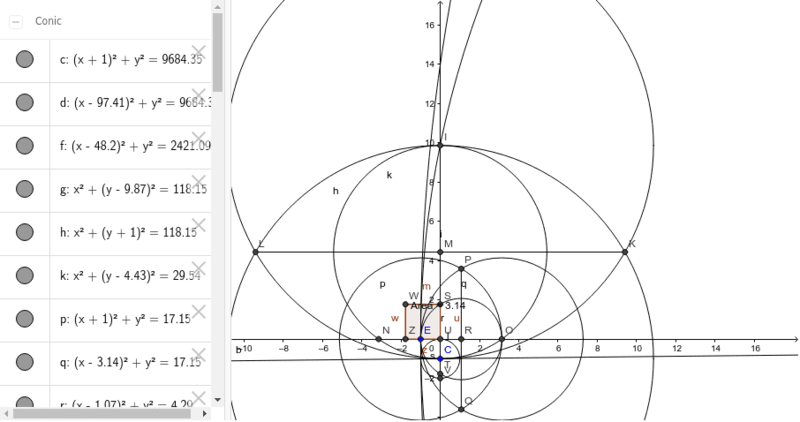 Using GeoGebra I and a team of researchers attemped to push take this problem to its ultimate level of fidelity within the confines of strict compass and ruler construction. We used Ramanujam's solution as a benchmark for our work. With the aid of the GeoGebra application we were able to develope a solution to this problem that pushes the level of fidelity of it to 16 digits. We believe that this is the ultimate level of fidelity for this problem within the confines of compass and ruler constructions.